The fruit and spice contained in this Pinot Grigio' aromas make it a wine for all hours and for all tastes. The maceration without the skins, the extremely low quantity of sulphur oxide used, the control of the fermentation temperature, make it a fruity, elegant, fresh, complete, and exciting wine. Colour: lively, deep ruby red; nature's gift of colour. Perfume: complex scents of mature red fruits (mainly black cherry), spices, notes of liquorice and hints of myrtle. 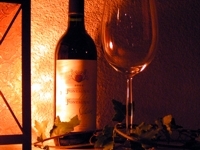 Taste: an elegant wine that shows unexceptionable workmanship. This dark ruby colored wine opens with a mild vanilla oak and leather bouquet with hints of earthy blackberry. On the palate, it is medium bodied, balanced, and easy going. The flavor profile is a gentle oak and mild raspberry blend with a touch of soft black cherry. Dry and full-bodied, balanced with a firm backbone and distinct character, aromatic with lingering persistence. Deep ruby red color with aromas of spring flowers, red fruits, minerals, and subtle earth tones. Fruit flavors are continued on the palate. Red wine with a strong personality obtained only by the vinification of selected grapes the smallest, most rocky areas of the Valtellina Superiore territories. It is produced only in the best vintage years. A red wine with a great structure but elegant at the same time. Burgundy red colour, typical of the vine grape varietals of origin. Intense and spicy bouquet, hints of fruit in spirit with clear notes of coffee, cocoa, roasted hazelnut and dried grape. Warm, vigorous, with a full, austere, rounded and balanced flavour. When young, it features a fragrance which is wonderfully spontaneous and full of surprise: in its bouquet, colour, and generous, velvety body this Langhe Nebbiolo brings out all the typical qualities of the magnificent vine it is made from. With the time its colour becomes garnet-red with strong orange hues, and its nose achieves more complexity, showing notes of withered flowers, such as roses and, above-all, geraniums. In the mouth it is warm, soft, full in flavour, velvety, well-balanced and lingering. grape: Lambrusco a foglia frastagliata. The grapes for this special wine are harvested in the second half of October by hand. Its ruby-red color fits the complex fruit aromas, particularly reminding about small forest fruits. Fermentation fully temperature controlled and followed by a period of maceration on the skins. Malolactic fermentation in Slavonian oak casks. 12 months period in 60 gallon Allier oak barrels, and further 24 months in fifty hectoliter Slavonian oak casks. 6 month period of bottle ageing. A very special Barolo, grown on a very special hill. Grape variety: Nebbiolo, Ageing: 24 month in barriques - 18 months in bottle, Serving temperature: 18°C, Alcohol content: 13,5% vol. The first 12 months of ageing take place in sixty gallon Allier oak barrels (during which the malolactic fermentation takes place) and are followed by a further 12 months in bottle. 1 bottle Vin Santo Occhio di Pernice 0,375 lt. - 1991 - Avignonesi, 1 bottle TBA Muskat Ottonel 0,375 lt. - 1998 - Velich, 1 bottle Tokaji Aszu' 6 Puttonyos 0,375 lt. - 1996 - The Royal Tokaji Wine Company, 1 bottle Sauternes 0,375 lt. - 1997 - Chateau d'Yquem. San Leonardo - 2011 - winery San Leonardo 51,45 EUR / 68,60 €/lt.